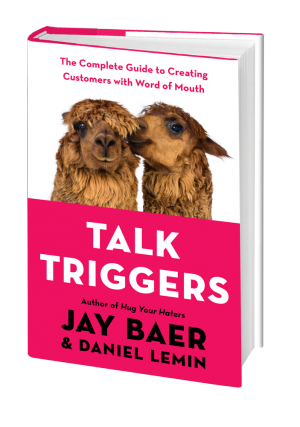 My new book, written with my friend Daniel Lemin, is called Talk Triggers: The Complete Guide to Creating Customers with Word of Mouth. You can get it all the places and ways books are available. Visit TalkTriggers.com for details and a ton of special bonus content. Here’s how we made it, and why it will help you. I realized that we have all spent so much time worrying about tools and tactics in recent years that we’ve largely left behind the real key: giving your customers a story to tell about your business. Hasn’t word of mouth been around forever? Why do we need another book about it? Yes. Word of mouth is the original marketing. And yes, there are a number of great books about word of mouth out there. We interviewed the authors of most of them for Talk Triggers. The difference is that most word of mouth books talk about why it’s important. We do that, but also show you precisely how to create word of mouth, in any business. A talk trigger is strategic, operational differentiator that compels word of mouth. It’s something special you do in your business that makes word of mouth involuntary. Your customers simply MUST tell someone else about it. But a talk trigger isn’t marketing. It’s not a coupon or a contest. It’s not a price or a promotion. It’s an operational choice that, in turn, creates a distinct marketing advantage. Why are talk triggers so beneficial? Your talk trigger is the memorable story your customers pass along on your behalf. And the best—and least expensive—way to grow EVERY business is for your customers to do it for you. In short, talk triggers turn your customers into volunteer marketers. How important is word of mouth? Extremely. Research shows that between 50 and 91 percent of ALL PURCHASES are influenced in some way by word of mouth and referrals (online or offline). Yet, and this is the amazing part: NOBODY has a strategy for word of mouth. We just take it for granted. Talk Triggers gives you everything you need to do word of mouth on purpose, instead of on accident. What kind of examples are in the book? Just about every kind! Daniel and I were very careful to represent the broadest possible cross-section of businesses in the Talk Triggers case studies. You’ll find compelling tales from businesses small and large. From companies in B2C and B2B. From organizations in North America, and from all over the world. How do you know this word of mouth stuff works? 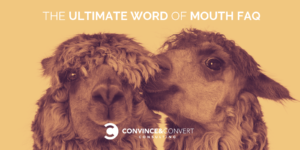 First, the principles and processes in the book are the exact same ones we use in our word of mouth consulting practice here at Convince & Convert. We use the same systems every day to create new customers for our clients. Second, the book itself includes findings from four separate research studies we conducted about what works, why, and how. In fact, we have an entirely separate research study about it you may like called Chatter Matters: the 2018 Word of Mouth Report. Grab it for free. Is this another boring business book? No! The case studies are fun, there’s a lot of humor in the book, and while it’s a serious (and seriously important) topic, it’s an easy and breezy read. It also includes a Quick Reference guide in the back so it’s easy to find key themes and stats later. And, each hardcover copy includes pass along cards that you can rip out and give to your friends and colleagues if you want to recommend the book. Who should read Talk Triggers? What’s the talk trigger for the book Talk Triggers? So there is literally zero percent risk in buying this book. Yeah, so what’s the deal with the alpacas? Our first cover concepts were … less than ideal. Daniel and I were messing around and I came up with something stupid featuring two ladies whispering. He took that and RAN WITH IT, and created the cover design of two alpacas talking. Are there different types of talk triggers? Yes. There are five categories of talk triggers you can use in your business to create word of mouth among your customers. They are: 1) Talkable Generosity 2) Talkable Speed 3) Talkable Usefulness 4) Talkable Empathy and 5) Talkable Attitude. For reference, the alpacas are talkable attitude. The money-back guarantee is talkable generosity. Can any business use these ideas? We really believe so, yes. We’ve been doing presentations and consulting about these ideas all around the world and we’ve yet to find an organization that cannot implement a word of mouth strategy using talk triggers. Grab a copy of Talk Triggers for yourself, your colleagues, your team, and/or your clients. Remember, money-back guarantee, too! Any questions, leave us a note at TalkTriggers.com, and we’ll be right back at you.